Following one of the most contentious and surprising elections in US history, the new edition of this classic text demonstrates unequivocally: Campaigns matter. With new and revised chapters throughout, Campaigns and Elections American Style provides a real education in contemporary campaign politics. In the fifth edition, academics and campaign professionals explain how Trump won the presidency, comparing his sometimes novel tactics with tried and true strategies including how campaign themes and strategies are developed and communicated, the changes in campaign tactics as a result of changing technology, new techniques to target and mobilize voters, the evolving landscape of campaign finance and election laws, and the increasing diversity of the role of media in elections. Offering a unique and careful mix of Democrat and Republican, academic and practitioner, and male and female campaign perspectives, this volume scrutinizes national and local-level campaigns with a special focus on the 2016 presidential and congressional elections and what those elections might tell us about 2018 and 2020. Students, citizens, candidates, and campaign managers will learn not only how to win elections but also why it is imperative to do so in an ethical way. Perfect for a variety of courses in American government, this book is essential reading for political junkies of any stripe and serious students of campaigns and elections. Covers the 2016 elections with an eye to 2018 and 2020. Explains how Trump won the presidency, the changes in campaign tactics as a result of changing technology, new techniques to target and mobilize voters, the evolving landscape of campaign finance and election laws, and the increasing diversity of the role of media. Includes a new part structure and the addition of part introductions to help students contextualize the major issues and trends in campaigns and elections. As the 2016 election taught us, important changes have taken place in how elections are won. Nelson and Thurber have assembled an excellent team of authors to help us understand prior elections and also train our sights on future elections. A distinct element of the book is the cutting-edge, insightful chapters by those actually doing the work of running campaigns, while being grounded in expert academic work. Together, they provide strong coverage of phenomena old and new to place campaigns in the broader context of American government: the use of big data, social media, and substantial unpaid-for traditional media; campaign finance, major donors, Super PACs, and 501(c) organizations; and polling, campaign management, the ground game, parties, and redistricting. Thurber and Nelson’s text is an important resource that brings together perspectives of both academics and experienced campaign professionals to evaluate central elements of the 2016 campaign, making the case "that campaigns matter." While these insights consider the influence of recent changes in digital technology, data, and social media in an increasingly polarized society, they also connect their analysis of key variables – the political context, voters, messaging, and money -- to the fundamentals of successful political campaigns. Campaigns and Elections American Style is the perfect companion to my unit on campaigns. The chapters are clearly written and appropriately sized, representing an ideal mix of academic analysis and practicioner experience. The new edition provides vital perspective on the 2016 election without over-focusing on its ideosyncrasies. The chapters on strategy, tactics, messaging, and communications are particularly useful for my in-class simulation. 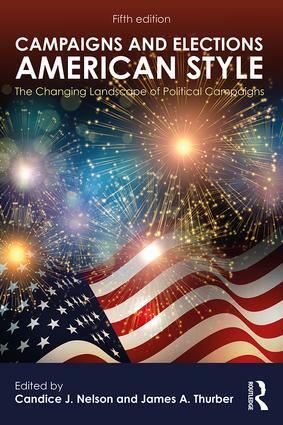 By combining insights from academic research on campaigns with first-hand experiences of campaign practitioners, Campaigns and Elections American Style provides a comprehensive and enlightening account of contemporary political campaigns at every level. Candice J. Nelson is Professor of Government, and Academic Director of the Campaign Management Institute, at American University. She is the author of Grant Park: The Democratization of Presidential Elections: 1968-2008;co-author of The Myth of the Independent Voter, Vital Signs: Perspective on the Health of American Campaigning and The Money Chase: Congressional Campaign Finance Reform;and co-editor of Campaign Warriors: Political Consultants in Elections; Crowded Airways: Campaign Advertising in Elections;and Shades of Gray: Perspectives on Campaign Ethics. James A. Thurber is Distinguished University Professor of Government, and Founder and former Director of the Center for Congressional and Presidential Studies, at American University. Dr. Thurber is the author, co-author, or editor of Obama In Office, Rivals for Power: Presidential-Congressional Relations; Campaign Warriors: Political Consultants in Elections; Crowded Airways: Campaign Advertising in Elections; The Battle for Congress: Consultants, Candidates; Voters, Congress and the Internet; and American Gridlock: The Sources, Character and Impact of Political Polarization.